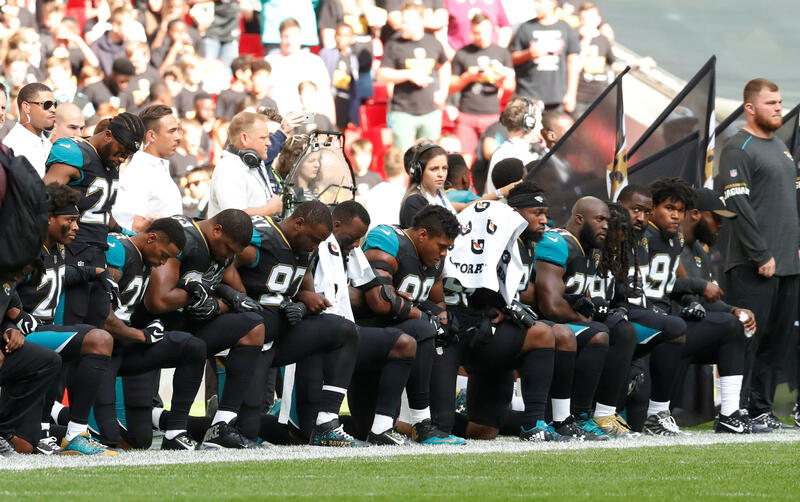 NEW YORK -- About two dozen players, including Baltimore Ravens linebacker Terrell Suggs and Jacksonville Jaguars running back Leonard Fournette, took a knee during the playing of the national anthem before the start of the teams' game at Wembley Stadium on Sunday in London. Players on both teams and Jaguars owner Shad Khan, who were not kneeling, remained locked arm-in-arm throughout the playing of the national anthem in an apparent response to President Donald Trump, who said this week that NFL owners should fire those who disrespected the American flag. Mr. Trump had a suggestion on Saturday for National Football League owners whose players decide to take a knee during the national anthem: fire them. He also said in a tweet early Sunday: "If NFL fans refuse to go to games until players stop disrespecting our Flag & Country, you will see change take place fast. Fire or suspend!" It was one of two tweets in which Mr. Trump continued to criticize the NFL Sunday, after he took aim at top professional athletes in comments that brought swift condemnation Saturday from league executives and star players. Baltimore Ravens owner Steve Bisciotti said later Sunday that he "100 percent" supports his players' decision to kneel during the national anthem ahead of the game. The Ravens issued a statement from Bisciotti minutes after kickoff, saying: "We recognize our players' influence. We respect their demonstration and support them 100 percent. All voices need to be heard. That's democracy in its highest form."